I decided to try a little game. As I wrote last week, I’m delighted by the random combination of words to make strange phrases, so I decided to combine whole sentences to make a strange story. Most of these sentences come from books on the shelves next to me. For the first I closed my eyes and picked at random. I happened to pick The Sauptikaparavan of The Mahabharata:The Massacre at Night, which is an apocalyptical tale. Not the happiest way to begin! In this story you’ll also find sentences from Faulkner’s Light in August, Sterne’s Tristram Shandy, Dostoevsky’s Brother’s Karamazov and a few other odds and ends. It’s a fun game, try it with the books next to you! Then, in a little while, the great tumultuous din–the roaring of men and other, lower moans–faded and died away. And that terrible swirling dust, my king, was in a moment absorbed by the blood drenched earth. We left the town in a panic, in a daze, blinded more by fear than by the dust itself. When we got to the road, as our eyes cleared, we could see what we had left behind. The sun died, too, and fell, gasping off the edge of the world, spreading long grasping crimson arms across the earth. And in this light we saw that the chaos was complete. Whole buildings had fallen, leaving only gaunt, staring, motionless wheels rising from mounds of brick rubble and ragged weeds. And let me tell you that we left with just the clothes we had on our backs. And they were tattered, they were rags, dirty strips of fabric matted to our wounds. We stumbled down the road, broken and bruised, charred and ruined, but always moving, trying to leave this day behind to fester in our nightmares where it belonged. In the distance on the road before us we saw a figure approaching, slouching towards us, with a long, strange stride, singing. He came nearer and we saw that it was a man, a large man with a perfect smile on his face. “Friend,” we said, “You must turn around, you must flee this place.” But he said, “I am done with running. Is it not better to be freed from cares and agues, from love and melancholy, and the other hot and cold fits of life, than like a galled traveler, who comes weary to his inn, to be bound to begin his journey afresh?” Well, we could not argue with that; what could we say to that, after all we had seen? We watched him on his way, and he raised a small rosy cloud of dust with each footfall, and soon we lost him in the sanguine whirl of everything. We turned on our way, and soon night, fresh and quiet, almost unstirring, enveloped the earth. It’s a purple purée! Isaac was mystified by this dish, but he ate it anyway. 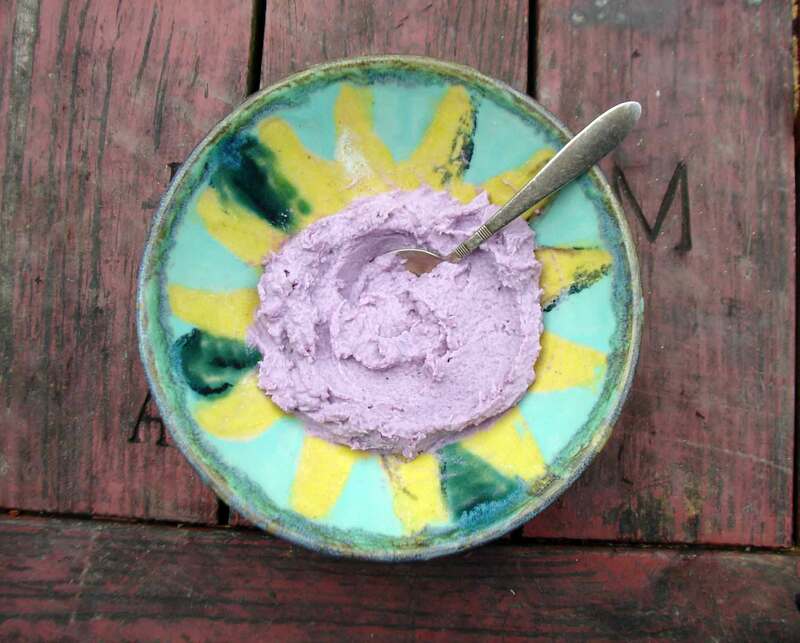 It’s a combination of a purple sweet potato, a regular potato and half a head of cauliflower, all boiled till tender and then mashed together till smooth. It was really delicious. I seasoned it very simply with butter, salt and lots of pepper, but you could jazz it up with various herbs and spices, or even with cheese. And of course that’s exactly what I did, I took words on loan.